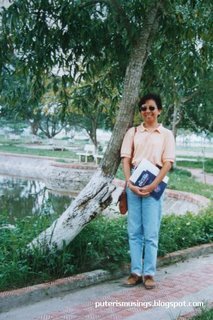 Ten years ago, this month, I arrived in Hanoi, Vietnam to serve as a volunteer English teacher at the Hanoi Agricultural University. I spent almost two years in Vietnam. What a culture shock it was! Everything looked strange. The buildings that I saw along the road to the university were tall and narrow. Paddy fields were every where. People on bicylces and motorcycles. Horse carts. The smell. Despite the initial shock, I adjusted quite quickly to life at the campus. I was the new foreigner at the campus and with all the attention I got, I felt like a celeberity! :-) The students were very friendly and eager to speak English with me. The English Language Department staff were very welcoming and made me feel quite at home. My classes were held in the evenings, and my job was to give them additional language classes other than those they received as part of their curriculum. The initial classes were always interesting because only a handful could speak English reasonably well, and the rest, most of the time I just had to guess what they were saying! Haha. But I got quite good at deciphering what they wanted to tell me. Besides teaching students, I also gave classes to a group of professors. They were really nice people and so eager to practise their English with a non-Vietnamese. I also taught staff at the Research Institute of Fruit and Vegetable. The Institute was just a few kilometres outside the university campus. The food offered by the food stalls at the campus were simple fare. The majority of the students at the university were very poor, and therefore could not afford anything fancier. Boiled kangkong and cabbage, and lots of rice, were staple food for the students. Initially it was hard, but as time went by, I began to enjoy the food and even had my favourite food stall. The funniest thing I saw as I ate among the students, was the sight of food served in a little plastic basin (it wasn't a bowl! ), and in it were the rice and whatever else that was ordered. I couldn't eat from that little basin. It reminded me too much of my dog's bowl! Haha. Anway the food stall owners knew who I was and of course I got my food served on nice little plates. I learnt to eat all kinds of things while in Vietnam. One of our (students and me) favourite activities in the summer was to go out and drink fruit smoothies .. delicious! My favourite was durian belanda smoothie. And I learnt to eat lots of freshly made yogurt. Boy, did that cause my stomach to "sing". I was/am lactose intolerant! :-( Other than smoothies, students always invited me to join them for "snail eating" sessions. The snails were really tasty! I learnt to use the lime tree needle (duri) to pull the snail meat out of the shell. Wow.. tasty with the fish sauce dip! And how about the silk worm pupae?! Heheh, I tried, but it tasted like insect to me, if you can imagine how insects taste like! Vietnam was and still is a communist country. At the university, the foreign teachers, as well as foreign students (from Cambodia and Laos) lived in a gated compound. There was a guard at the gate, and no Vietnamese student was allowed to visit the foreign teachers unless specifically invited by them. Even then they were not allowed to stay too long. Many times my students got scolded by the guards for visiting me. The foreign students didn't have trouble bringing in their Vietnamese girlfriends to their dorm. I guess foreign students were less of a threat to the Vietnamese. Keeping out students was not the only job the guards had. I knew they were keeping tabs on my activities. The Guest House cleaning lady was also "spying" for the university. :-) Anyway, I got used to it. But the hardest were the rumours and speculations of sexual encounters between me and other male guests living at the Guest House. I just looked at it as being kampung type mentality for people who had nothing better to do but speculate about other people's private lives. Rindu amt baca experience nuan di Vietnam, mana utai ke paling meri kesan mendalam ngagai nuan kini lepas idup begulai enggau org din. interesting post! share with us more about yr experience while in vietnam or anywhere else you could have taught as an english teacher? Other than in Malaysia, Vietnam was the only other place where I had taught English.